"A great-sounding mixer which employs all of Allen & Heath's experience and heritage in this marketplace. 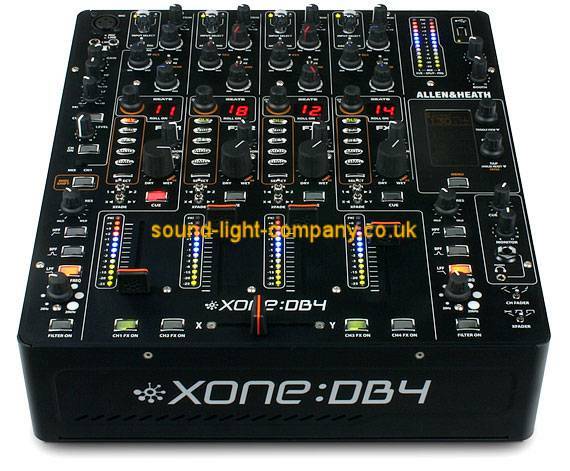 Great build quality and a wealth of sound manipulation options make the Xone:DB4 a true contender for Best Club Mixer." The heart of the Xone:DB4 is the powerful Quad FX Core DSP engine, enabling each channel to have its own FX bank and BPM detection system, which automatically adjusts all time-related FX and loops to the tempo of the music. There are 5 studio quality FX types optimised for DJ use • delays, reverbs, modulators, resonators and damage - plus each FX type has a patch library of different effect variations. Each FX bank has a dedicated expression control and a rotary pot to set the wet/dry level, whilst further tweaking can be performed using the global controllers in the FX master section. Booth, record and phones • source selectable and level trim. Booth and main • phase and level trim controls. DB4's lightweight aluminium chassis is designed to make touring with the console easy.